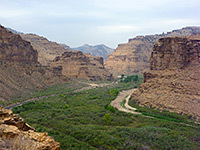 One of the largest areas of essentially uninhabited and roadless land in Utah is either side of the Green River as it flows through Desolation Canyon, between Vernal and the town of Green River. The south and west of this vast expanse, 100 miles across, is bordered by the Book Cliffs, which create an imposing barrier, 1,000 feet high. Other ridges and ranges fill the central portion, including two elevated regions either side of the river - the West and East Tavaputs Plateau, and so cross-country travel in this part of the state was traditionally only possible along the valleys of the few major tributaries of the Green River, and to the west, the largest is Nine Mile Canyon, named not because of its length (which is nearer 45 miles), but probably on account of explorer John Wesley Powell, who used a 9 mile transect (study line) when mapping the adjacent section of Desolation Canyon. 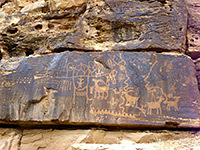 People have used Nine Mile Canyon as a thoroughfare for some 8,000 years, and the smooth, layered sandstone cliffs lining the canyon floor are covered with many thousands of inscriptions - mainly petroglyphs but also some pictographs, principally from the Fremont Culture between about 300 and 1200 AD and the Utes around the 16th century. 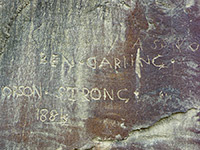 More recent signatures have been left by later explorers, towards the end of the 19th century. In terms of number, complexity, ease of viewing and the good state of preservation, Nine Mile Canyon is probably the best place on the Colorado Plateau to view petroglyphs; the only aspect that is perhaps less good compared to other locations is the rock color as here at the sandstone is dull yellow brown, and somewhat overgrown, unlike the bright red and orange of other locations further south. The road to Nine Mile Canyon (see map) starts just east of Price along busy US 6/191, in a part of the state otherwise lacking in famous natural attractions, although the vast wilderness of the San Rafael Swell begins a little way south. 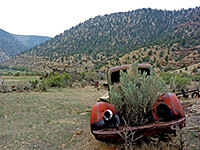 For many years the road was mostly unpaved and lightly traveled, but this changed in 2004 when the Bill Barrett Corporation was granted a license to develop the West Tavaputs gas field, on the mesa tops north and south of the canyon. As part of this agreement, and to compensate for the greatly increased traffic, the road has been improved and upgraded; full paving is likely to be complete during 2013. A few industrial sites have been constructed along the canyon floor, and at least one produces compressor noise audible for a mile or so, but the vast majority of the canyon is unaffected. A year-round creek flows through the valley, which is about a quarter of a mile wide, and the road also passes many relics from the ranching history of this area; crumbling wooden barns, stone foundations, rusty equipment and other debris, all (like the vast majority of the rock art) right beside the road and so easily explored. 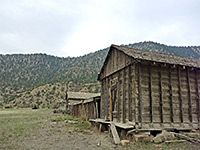 There are still several working farms including Nine Mile Ranch and Nutter Ranch; near the former is a BLM campground, useful since primitive camping is not allowed in this area. The distance from US 6 to the furthest petroglyph site (the Great Hunt Panel) is 46 miles, and because many sections of the road are narrow, winding and undulating, driving time is quite long, at about 90 minutes. The canyon may also be reached by paved road from the north, from Myton, a 32 mile drive that passes no petroglyphs but is still quite scenic. The road from US 6 heads north across farmland, through the sagebrush-covered foothills of the Book Cliffs, and into the valley of Soldier Creek, which provides a route through the cliffs to the elevated grassland (Whitmore Park) on the far side. It then climbs a little more to a high point (7,501 feet) at a pass, and enters the far upper end of Nine Mile Canyon, now cutting through the Roan Cliffs - Tertiary rocks that overlie the older, Cretaceous strata of the Book Cliffs. A tributary (Minnie Maud Creek) joins from the west near milepost 21, which is marked by a BLM notice welcoming visitors to Nine Mile Canyon, as this is the start of the main section of the drainage. The first petroglyph panel is reached 5.2 miles later, but this is not obviously signposted, as is the case for the vast majority of the dozens of easily accessible sites in the canyon, for 20 miles east. The next point of interest, at mile 27.2, is Cottonwood Glen, a parking/picnic area beside the ruins of a ranch established here in the late 1800s. 4.7 miles further, Balance Rock has an extensive and varied petroglyph panel, notable for an unusual human figure who seems to be holding balloons or juggling balls. Near here is the site of Harper, once a stagecoach stop on the route between Price and the Uintah Basin. Remaining structures include a small group of wooden buildings, on both sides of the road, accompanied by a collection of photogenic trucks, cars and other ancient equipment. For the next ten miles the road passes more petroglyphs, pioneer signatures and a ruined granary, before one of the two main rock art sites, at the mouth of Daddy Canyon, where a 0.75 mile trail runs along the base of the cliffs at either side of the drainage. Some of the panels are high and need a little scrambling to see, while others are at path level. The most famous location in the whole canyon is 2 miles further, a short distance down Cottonwood Canyon, a south-side tributary. 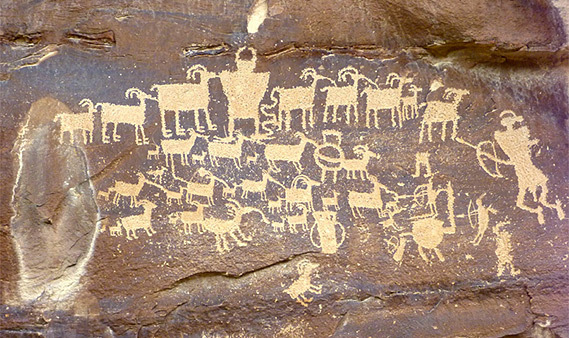 This is the Great Hunt Panel, depicting a group of about 30 bighorn sheep, accompanied by hunters with bows and arrows. 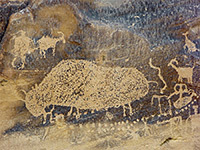 More petroglyphs, and pictographs, can be found close by, while on the opposite (east) wall of the canyon are more designs including the Big Buffalo, the largest of many depictions of this animal in the canyon, and part of the evidence that a flourishing bison herd once lived here. Access to the Great Hunt has recently been reconfigured and improved, another of the enhancements paid for by Bill Barrett Corporation. 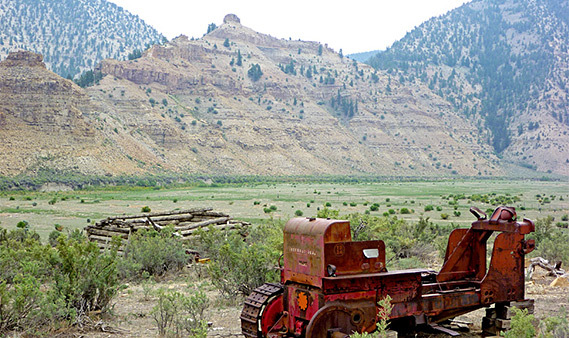 One other location nearby is the Fremont Village, the not-too-impressive remains of a Fremont pit house, reached by a short, steep path that also provides a grand view up Nine Mile Canyon. Further east, the deepening canyon continues 17 miles to the Green River, but there seems to be no rock art in this section. The road extends only another eight miles.